Wi-Fi has created a large market opportunity for operators, and that opportunity is attracting increasing competition. As a result, as providers attempt to secure locations and launch services, the race to capture this opportunity will go to the swift. 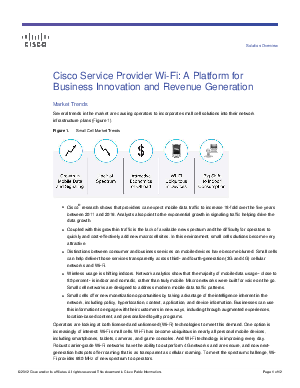 In this paper Cisco presents its research findings and provides the four important ways that Cisco can help service providers capture the Wi-Fi opportunity with Cisco Service Provider.